From early on I observed nature but felt that I could never register or remember enough of what it suggested. It is unfortunate that all my preliminary work has been lost. Those studies, and many precious family belongings that my mother packed before the 1940 exodus from Paris, were destroyed during an air raid at the crossing of the Loire River along with the truck that carried them. However, thanks to my frequent visits to museums, it became clear to me that painters retain only what is convenient for them, what agrees with their own temperament, with the examples of past masters whom they choose to adopt as ancestors or with the exotic cultures that have had an impact on their work. In Fishermans Daughter (1942), my emulation of Paul Gauguin is blatant, evoking his bright harmonies and willful primitivism that originated in Brittany, the very region where I spent many summer holidays. To observe nature doesnt necessarily mean to walk everywhere with a sketchbook in hand. It can result from the sustained interest in whatever captures the artists attention and what sinks into the hidden recesses of the subconscious mind. Such features and fragments are ready to reappear whenever called for, stripped of irrelevant details. Appropriate observations, endless exercises and guidelines are necessary to acquire a well-trained visual memory, but it is also important to devise a method of access and retrieval into that wellspring of intuitive knowledge. 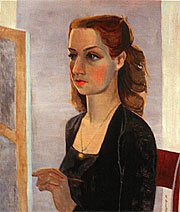 I recently acquired an early self-portrait, Portrait in Black (Myself at Work) most probably from April 1943. I was astonished by the classicism of its composition and the restraint of its color scheme limited to grays, ochres and blacks. The face, lit from the side, is set in a three-quarter stance. The torso is lean and erect like a horse riders, the left hand holding a brush instead of reins and directing it towards a canvas that is visible only from behind. The general feeling is not just of stern melancholy, but bespeaks of quiet desperation, a mood seldom apparent in an oeuvre that most often avoids subjectivity. What still captivates me in this picture is the complete absence of excessive expressionism: no revulsion of features, no muscular tension, no aggressive color contrasts. To the contrary, it is the effort undertaken to present a stable coolness, an apparent detachment within a static construction that reveals the inner distress. Day-to-day existence was endured with total constraint during the Second World War. More recently my pictorial language is more joyous and free, and imagination is the leading factor. A landscape is evoked, but that landscape doesnt exist anywhere in nature. It comes to life step-by-step on the canvas along with the build up of its composition. There are no longer any preliminary sketches or scholarly abstraction where the whole is slowly purified by the progressive omission of unnecessary details. In my recent proceedings, it is the opposite. I begin with a nonfigurative proposition and by the conjunction of visual signs, I lead myself (and the viewer as well) consequently toward a possible resolution, a reinvented paradise. A conic shape can become a yew tree whose real counterpart actually exists around Avignon. An arched bridge similar to mine may still be used during the rainy season in the Rousillon. Perhaps some olive trees would find a rightful location in Greece next to a field of ruins. They come along, in one canvas, not called by my memory because I may never have seen them, but because they call upon each other to coexist like people who bump into each other to be part of a group photograph. Many contemporary painters have once and for all eliminated all references to the tangible world, but by doing so they deprive themselves of the viewers recoil when facing the free interpretation of people and things presented by the artistic mind. The destruction of visual conventions, clichés and trite mental perceptions is an important adventure. Why should painters deprive themselves of astonishing or irritating the public by showing usual objects in an unexpected fashion or within bizarre concatenations that madden or beguile? In my most recent works, colors and structures shoulder each other in a very playful manner and do not attempt to express anything other than what springs as evidence from their inner configurations and conjunctions whose only magician and arbiter is myself. At last the objects painted and the pictorial space itself are no longer originating from the tangible world. They are mental objects, figments of the imagination, compositions that are poles apart from informal art. This is not a form of escapism or a way to negate reality. It is a means to bypass the tedium of what we already know and reach out to invent potential answers for the future. The very simple Greek landscapes of this period were intended as counterpoints to the more visually and symbolically complex canvases Gilot was also creating at this same time. Here, Gilot develops a sense of landscape through the horizontal disposition of luminous colored planes rather than through either traditional spatial recession or the definition of landscape components. Architectural forms and volumes act as foils to fields of sun struck color. Despite the quiet mood of these paintings, the high-keyed color harmonies and varied and shifting brushwork patterns create a sense of immediacy and vitality. 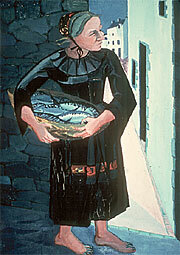 In spring 1997, Gilot returned to Brittany, one of her favorite holiday destinations. Accompanied by her daughter, Aurelia, and her two children, Cecilia and Lorenzo, Gilot took long walks on the moors to show her grandchildren the views and vistas she fondly remembers from her childhood, particularly the inspiring Stones at Carnac, alignments from the megalithic period. Upon returning to her Paris studio, Gilot painted several canvases, more modern interpretations, of the Brittany landscape she often sketched as a young painter. © 2018 Françoise Gilot. ALL RIGHTS RESERVED.